There are numerable delicious combinations and healthy options with a good piece of salmon fillet. This time, I have decided to go with something that’s rather simple, but so magnificently healthy that will improve your overall health and well-being. 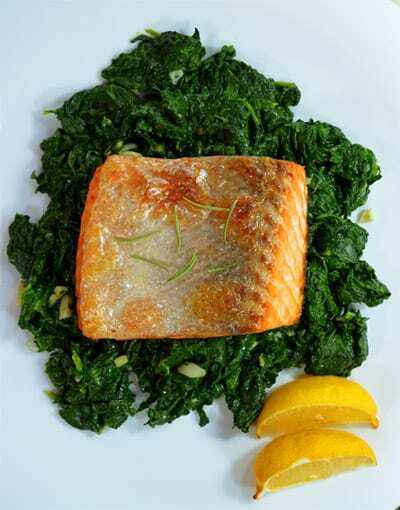 Salmon and spinach, combined with garlic and olive oil, is undoubtedly the world’s healthiest nutritional choice you can find at your table. Add just a small pinch of fresh rosemary, sprinkle with a couple of lemon drops, and there you go - a meal truly worthy of remembering! Grease a large sauté pan with olive oil and heat up over medium-high heat. Place salmon fillets and season with rosemary, salt, and pepper. Drizzle with lemon juice and pour in about ½ cup of water. Cover with the lid and cook for 20 minutes, turning once. Meanwhile, rinse and drain the spinach. Place on a clean work surface and cut using a sharp knife. Add to the pan along with garlic. Give it a good stir and cook for 3-4 minutes. Serve immediately.